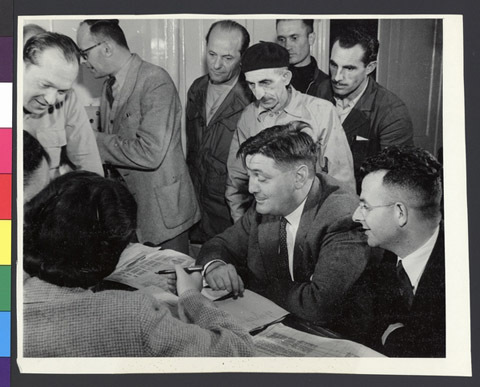 JDC - Archives : Signing on the crew of the ship to take orphans from Apeldoorn to Israel. Title Signing on the crew of the ship to take orphans from Apeldoorn to Israel. Description Signing on the crew of the ship to take orphans from the Ilaniyah Children's Village near Apeldoorn, to Israel. In the lower right hand corner is Joseph Voet, JDC Director for Holland, and at the extreme right, a representative of the State of Israel.